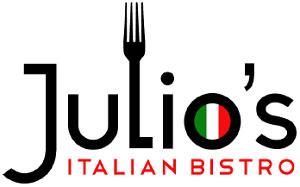 Online ordering menu for Julio's Italian Bistro. Our passion for serving great pizza is clear here at Julio's Italian Bistro. Everything that goes into our pizzas is the best it can be. Our dough is made from scratch and hand-kneaded to create each crust. We use only select California tomatoes, blended with our secret Italian herbs and spices, to create our satisfyingly robust pizza sauce. Even the mozzarella cheese that tops our pizza is special. In addition to our pizzas, we serve soup, salads, wings, subs, and more! Our pasta dinners include Chicken Parmigiana, Fettuccine Carbonara, and Shrimp Scampi Linguine. Don't forget to try one of our desserts! Find us just north of Palmetto Bay park on Dixie Hwy. We're not far from South Dade Shopping Center and the Miami Zoo. Order online for carry-out or delivery!